Among the countless things I didn’t anticipate before becoming someone’s mom is the amplified significance I would attach to everyday objects. Take my son’s lunch box—not something I imagined would turn me all jelly-kneed. Yet I’m hopelessly, outrageously, sentimentally attached to the lunch tote I bought for Q at the beginning of his pre-K school year several years ago. I just needed something reusable, durable, and easy to clean. I mean, he was four. Still, lunch boxes are extensions of ourselves, highly visible badges of our personalities and tangible reminders of home. Did my son’s midday comfort meal really need to be pulled from a yellow plastic Sponge Bob box? Or one that depicted battle-thirsty Transformers? Those choices seemed too commercial, too impersonal, too out of sync with our general values at home. Then I happened upon Bazura Bags. Afterschool clean-up is easy: just wipe the foil interior of the bag with a damp cloth and let dry. And because the bags are one-of-a-kind, handmade from found materials, you also get the surprise of not knowing exactly what to expect when you place your order, which adds to the fun. 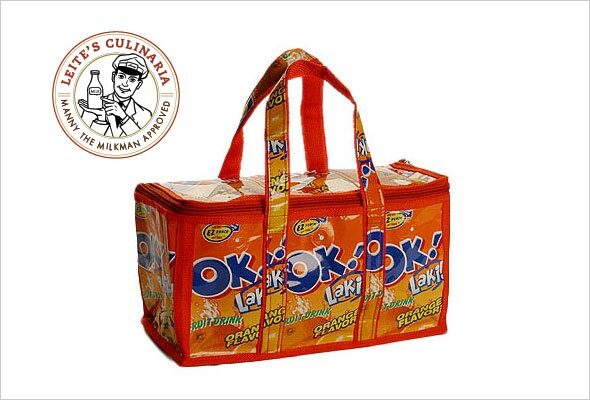 At home, we now have Bazura Bags made from “Zest-O” apple juice containers, “OK!” orange flavor packs, and Q’s favorite, the “Choc-O” brand bag whose design features a goofy cartoon cow in a red cowboy hat. The co-op, formed by six women with no start-up capital and only the assistance of the local village council, has grown into a “Livelihood Project” that now includes more than 800 members. Since that first year of school lunches, I’ve became so enamored of Q’s tote—and the story of the co-op—that I can’t stop myself from adding to our collection every back-to-school season, even though his original bag is still in good working condition. Last year, I even bought one for myself. Now when I pause in the middle of the day, pull out my own eco-chic Bazura Bag, and consider everything attached to it…well, like I said, it’s funny what the parental heart clings to. Bazura Bags Lunch Totes start at $15.95 for the smaller size, which easily holds the equivalent of a brown paper lunch bag. They’re available online at BazuraShop.com and Reusit.com, as well as at select stores in the U.S. and Canada. Bazura Bags also offers more than 80 styles of bags and accessories, including shopping bags, backpacks, purses, and wallets.